Seaman spoke briefly at a press conference Monday. “I want to make it clear that my actions on that day, in my mind, were the only acceptable actions I could have done given the circumstances,” Seaman says. "I deeply care for my students and their well being." Seaman thanked the first responders – another West Middle School teacher and a police officer – for helping keep Ella Whistler, 13, alert while waiting for help to arrive. "I can't say enough how proud of Ella I am and how we all should be," Seaman says. "Her courage and strength at such a young age is nothing short of remarkable and we should all continue to keep her in our minds as she continues to recover." Whistler's family released a statement late Friday evening and said she is in critical but stable condition at Riley Hospital for Children in Indianapolis. 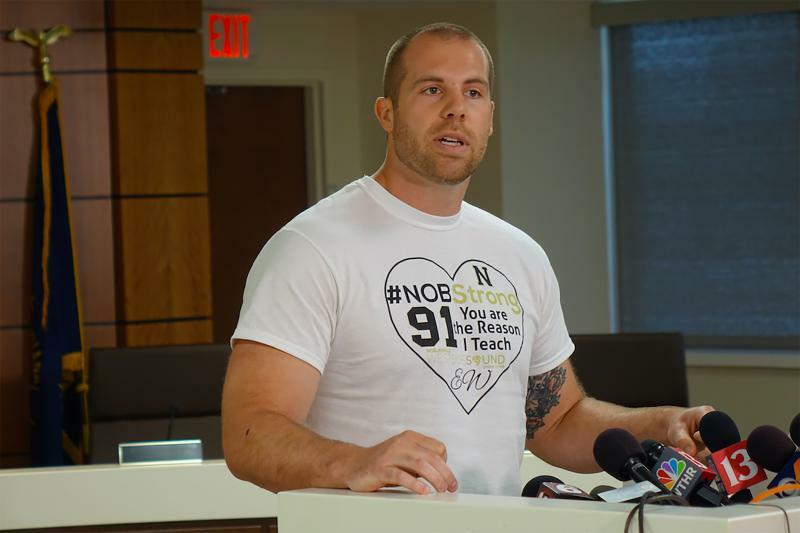 Seaman thanked the Noblesville High School student who established his GoFundMe. A separate GoFundMe was established for Whistler by a family friend. Noblesville Schools has established a victims' fund as well. "I'm still processing much of what has happened but I can say with absolute certainty that I am proud to be a [Noblesville] Miller," Seaman says. Seaman's actions were praised by President Donald Trump, and many others. At a vigil Saturday, Gov. Eric Holcomb (R-Ind.) says Seaman is an "overnight hero." "To know that Jason put others before himself is not a surprise – I’ve found out – to anyone that knows him, I’m so proud that Jason is a Hoosier," Holcomb says. The press conference featured brief remarks from Seaman, Noblesville Schools Superintendent Beth Niedermeyer and Middle School West Principal Stacey Sean. No questions were taken.